Lawn top dressing is when you apply a thin layer of material onto the lawn. Lawn dressing is often done with sand and that’s where the problem is. Sand is used because people think it will improve air space and water infiltration and drainage. These are important organic gardening goals, but top dressing lawn with sand does not help achieve them. No matter what your soil is composed of, putting sand on top can cause drainage problems and dry pockets in the soil. And there’s more. If you’re lawn top dressing with sand onto your clay soil, it can form a soil that is like concrete. And since sand doesn’t have any nutritional benefit or any ability to hold onto nutrients, you are decreasing the fertility of your organic soil. It is not as bad to use sand on golf course greens because they are already made of sand, but even then, it is not very helpful. Regardless, in a residential lawn, it is harmful. This method of lawn dressing is what should be done after aerating a lawn. One of my favorite organic gardening tips for if you want to do a really good job, after aerating and before adding the compost, you can add other soil-enhancing products such as mycorrhizal fungi, liquid kelp and any minerals that you need based on a soil test, such as calcitic lime and soft rock phosphate. Doing all of these things is organic gardening heaven for your lawn. It is best to do all of this after aerating because the amendments and compost get down into the root zone where they belong. While you shouldn’t need to aerate every year once your lawn is healthy, topdressing with compost is always a good idea. You can do it spring or fall or both. You can rent a top dressing lawn machine to do this, but I have never had much luck with it using compost. I just do it with a shovel and rake. As I discussed in Lawn Dethatching And Lawn Rolling, dethatching is a last resort to use only when the thatch is simply too much. The thatch will keep coming back until you address the root cause, which is inadequate soil microbial life. Continual dethatching will only exacerbate the problem. Lawn rolling can be helpful during installation, but it is generally detrimental on an annual basis because it just compacts the soil, which is the opposite of what your organic gardening goals are. As I discussed in Aerating A Lawn With A Lawn Core Aerator, lawn aeration can provide benefits if done during the fall or early spring by a machine with sharp tines that removes the soil cores. It must be followed by top dressing lawn with good compost and optional other amendments. Lawn dressing with sand is detrimental, but a good 1/4 inch to 1/2 inch of compost annually provides many benefits. So if you’ve been aerating your lawn, I hope you’ll now top dress it after, and if you’ve been top dressing with sand, I hope you’ll use compost instead. Let me know your thoughts below. anything important to know about the compost? How do I know ‘good’ compost? Hi Bern, it should smell good, look finished (so that you can’t tell what it’s made from), and you should confirm that it was made without toxic materials.If you’re doing a lot of this, like on a commercial scale, you should get a chemical and biological analysis to make sure it has a good nutrient and microbial balance. The soil in my yard is mostly sand and clay causing the centipede grass to grow very thin. It doesn’t hold water very well, etc. I had used compost that I made from grass clippings, shredded paper and used coffee grounds to plant new sod where I couldn’t get it to grow. It became the thickest, greenest, healthiest section of grass in my yard. I can’t do that for my entire yard but I can I use the same compost to “topdress” the rest of my lawn and potentially get the same results? Hi Shannon, topdressing with good compost is definitely an excellent idea. Whether or not you get the same results is hard to say, but if you can do it every year for a few years, the grass should get healthier and fuller over time. Be real, I live in Staten Island,NY There is only one landscape compost/soil bulk delivery I viewed it and it’s outdoors with rocks,branches and God knows what else . If you asked the clerk about a printout of some kind of analysis he or she would respond ‘Forget about it! Dirt is dirt it’s all the same. So since I don’t have a truck myself & am 62 years old it would be a bit for me to rent a truck then drive to a more reputable garden center in NJ then shovel 3 cubic yards into my rented pickup truck. Instead of lawn renovation I would be calling,if capable an ambulance. All kidding aside any ideas? If you have space I would consider getting a couple compost containers and making your own to top dress the lawn every year. It’s real easy to make compost it just takes a little time. You might be able to find some used ones really cheap on those classified apps. You can use solid tines, that will help with drainage since you will be creating macro pores. But drainage isn’t usually just a surface issue that can be resolved with some 4 inch holes in the ground. It could definitely help for mild drainage issues when the soil surface is an impenetrable layer, but I’ve found most issues to require actually installing drainage or otherwise vastly improving the soil’s ability to infiltrate and absorb water. Ever try an unscented dish detergent/water mix? If it takes grease out of your way, shouldn’t it also loosen up compacted soil? Interesting idea. How do you figure that would work, Jeff? I cut down 65 large sweet gum trees on my property and ground about 40 of the stumps. I put one 50 lb bag of 40-0-0 (urea) on the wood chips/soil to accelerate the decomp of the chips. Now I have 6-10 inch depressions where the stumps were. If not sand, what should I used to level the ground where the stumps have decayed? That’s one case where you do need to bring in soil. It’s best if the soil has a similar texture to your existing soil. So if you have sandy soil, bringing in sand or topsoil would be okay. If you have clay, bring in topsoil instead of sand. Be sure to mix it well with that existing organic matter if you can, rather than just dropping it on top. I want to raise the level in uneven areas in my yard using sand, is this the best product to use? If your soil is sandy, sure, you can use a course sand (not sharp sand), but if your soil is more of a loam or clay, perhaps a topsoil would be a better match. My lawn is 6 weeks old. Unfortunately uneven areas are starting to show. I’m assuming top dressing is the solution to even out these areas. However, is it imperative to aerate the lawn before applying compost, the lawn being newly laid? Definitely not. To me, it’s important to use compost and fertilizers after aeration, but you don’t have to aerate in order to use compost. You may need to use some topsoil to level out some areas, because compost does break down. Thank you for sharing your knowledge. Do you have any experience with lime pellets? I do understand they help raise the PH levels in the soil. You won’t have killed it if you did it fairly recently, but if it is so thick that the grass just barely pokes through, you might consider raking some of it into your gardens or just into a pile somewhere. I have about 1.35 acres of Bermuda grass. We have a 2.6 acre lot, of which the other area is driveway, and trees and pond. We started with just weeds, and seven years later, solid Bermuda except some shade grass. I have unlevel areas. Some of which is my fault because I rented a sod cutter, and transplanted grass. Some low spots was from erosion when e ouse was built before grass grew. How should I level my low spots to keep from scalping my lawn with my walker mower? I can’t wait to mow every 3 days. You want to use a medium that is similar to your existing soil. If your soil is sandy, use sand. If it’s clay, use more of a topsoil. Depending on how big the discrepancies are, you may have to do it in stages so as not to smother out the grass, but as long as you can still see the tops of the grass after raking it in, you’re good. For annual maintenance, I often just put down a layer that is 1/8th inch thick, which means 1 yard covers 2600 sq ft. The first time I do it on a lawn that needs help, I might use 1/2 inch, which means 1 yard covers 650 square feet. Hi Phil,What would be your suggestion for top dressing a football field (actually 4)?! I help run a youth football organization and we just had our county deliver a boatload of sand. We have some ruts, potholes, and a bunch of unevenness and our soil is Georgia Clay!I definitely don’t want to damage our grass, but we have to fix our holes.Thanks! Personally, I would topdress with more of a clay-based soil. It’s not that clay is good for a football field – it’s just that a layer of sand over a layer of clay can really stop the water from moving down into the clay layer. I live in Denver, CO. It is semi arid here and I have very sandy soil. I rented an aerator in early spring and it did an ok job but I don’t think the tines were very sharp. Therefore the plugs were not very big. Maybe an 1″ or so. Anyhow, some of the lawn areas are struggling and I’d like to try and recover it. Can I aerate again in June or will it harm the grass too much? I think the drainage in those areas is not great so I’d like to aerate and then top dress with compost now if possible. Would it be better to wait until the fall to do this? Yes, wait until fall when the roots are actively growing. Aeration doesn’t do anything to improve drainage anyway. Really, aeration only offers short term benefits, other than the fact that it allows you to get that compost and other fertilizers/inoculants down into the root zone. Just added a layer of sand to a thinning area of st.augustine. Thinking I’m getting too much shade. Also added fertilizer spikes at dripline of bradford pear tree. Absolutely. It’s just nice to do it while there are still holes for the compost/EM/etc. to fall into, in order to get the most benefit. After lawn dressing, do we have to water it ? Yes if you’ve overseeded, no if you’ve only topdressed (unless the lawn needs water of course, in which case you should water it). What you say about dressing with sand is ill-informed. In particular, sand does not form a concrete-like surface with clay. Thank you for all the great information. I have been searching for a turf care company to dethatch my hybrid zoysia lawn. Unable to find one, but found your site. Now I know why no one dethatches and how to take care of my 25 year old lawn. Events beyond my control had caused me to neglect it for a long while and I didn’t know how to begin restoration. Thank you so much for such a clear, comprehensive article. I have zenith zoysia, it was put down as sod in Nov 2015 on top of very sandy soul with a very thin coat of topsoil. In hindsight I should have put much more topsoil down. I’m entering the second growing season in north Florida, the lawn is greening up but I have to water more then I expected otherwise it gets dry and crispy in just a few days. Im considering topdressing it to add nutrients and smooth it out a bit, should I airrate it as well? Also, I have high PH, close to the beach. What’s the best way to lower the level a bit. Thanks. You could definitely topdress with good compost – that will improve the water-holding capacity of the soil, among other things. The only reason to aerate would be to get that compost further down into the root zone. If you did that, you might want to add a mycorrhizal fungi inoculant, too ( https://www.smilinggardener.com/sale/mycorrhizae-for-sale/ ). And make sure you leave your grass clippings right on the lawn – they will gradually increase the organic matter content as well. As for pH, you don’t necessarily want to lower it. But if you do decide to send a soil sample to a good, organic soil lab and follow their recommendations, the pH will gradually moderate. Does adding compost to your lawn on a regular basis raise the grade of the soil? I’ve already raised all of the sprinkler heads in my yard once and I don’t want to have to do it again. Your thoughts on this would be appreciated. Good question. Yes, it will very slowly raise is, but I’m not sure what the rate is because the compost does get broken down over time as well. We have a Zeon zoysiagrass installed a year ago and half of it is greening up but half is still brown. We had it evaluated and were told that it has fungus because of probably irrigation preoblem as the clay soil is compacted. We had the brown patching treated with fungicide and had it core aerated and will topdress it with a compost. Should we topdress the green and good parts too or just the thin and still brown turf? Do we need to aerate and compost topdress every year? Thanks! Your reply will be greatly appreciated. If you have the time/money to do the whole lawn, it’s always a good idea. Whether you have to do it every year depends on the health of the soil – healthy soil never needs it. It may be that do you do it once or twice and that does the job. What’s the best method for getting rid of clover, dandelion, and other weeds? We have bermuda that was laid probably 10 years ago and is well established over most of the lawn, but there are areas in the back that seem to be taken over by weeds. -Soil fertility. If you send a soil sample off to a good soil lab, they will help you figure out which nutrients your soil needs – imbalanced soil fertility leads to weeds. -Soil biology. Applying good compost and/or compost tea and/or effective microorganisms will help strengthen the good grasses so they can outcompete the weeds. -Mow high. If you keep your grass tall, at 3 or even 4 inches, and only mow when really necessary, you’ll block many of the weeds. And don’t mow in the summer when it’s really hot and the grass is hardly growing. -Water. 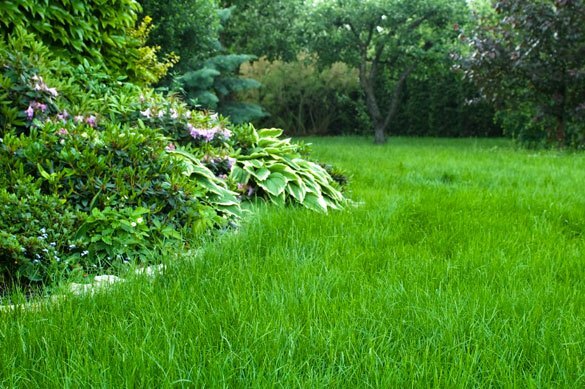 It’s okay to let a lawn go dormant in the summer, as that’s what grass has evolved to do, but just note that it leaves space for weeds to take over. If you want the lawn to stay healthy, water deeply and infrequently when needed throughout the hot months. -Bag the seeds. Normally we want to leave the grass clippings on the lawn as fertilizer, but when a weed is producing seeds, it’s worthwhile to bag the clippings and either hot compost them or get rid of them. -Corn gluten meal. It can sometimes work to control weeds in a lawn IF it’s applied correctly (before the weeds have germinated in the spring, the right weather conditions, etc.) every spring for 3 years. It gets quite expensive for a big lawn, but worth a try on a small lawn. -Cinnamon and baking soda. As a short term measure, you can try mixing 1/2 cup of baking soda with 1 teaspoon of cinnamon per gallon of water and spraying that on the weeds. I have read all the reviews on the site, I must say they have been very interesting. I was told this week to put lawn sand on my lawn, however, I am in a predicament, my lawn is old ?? not shaw how old as we have lived here for 10 years. I clarified the lawn a few times but told I am overdoing it. I have now perched some sand but the comments seem to be in conflict with each other. If you have an answer I would be most grateful. I have read in the articles to use compost/ home made compost??. thank you. If your soil is already very sandy then top-dressing with sand can be helpful if you need to fill in holes. Other than that, there’s rarely a reason to do so. Adding sand on top of a clayier soil isn’t a good idea, and besides, sand doesn’t bring much benefit overall. Good compost, however, does. Certainly, we have gardened on heavy clay for almost 40 years and, for UK conditions, course sand seems to be a very good top-dressing. Thanks for sharing, Colin. That particular article is loaded with poor advice, but as for the topdressing clay soil with sand part, it’s usually a bad idea. Here’s an excellent video showing how water moves through soils that have various texture layers ( https://www.youtube.com/watch?v=DmTNFIEc2VA ). Aerating the soil and then filling the holes with sand will help water penetrate better for a while, but when those sanded holes eventually get covered by other organic debris and soil particles, they become especially dry areas in the soil. Hard to explain, but the video eventually gets into it. Many thanks for your reply. Personally, I would ascribe the problems you attribute to the use of course sand as a top-dressing on clay not to the material but to poor technique. Sure, if you try to get a quick fix for a lawn full of divots, worm-cast and mole-diggings by chucking down a load of sand and pushing it into the hollows you are going to create dry patches and general non-uniformity. But if you do the job properly – which means lots of deep aeration prior to top dressing and a sparing application of that dressing and doing it twice a year – the uniformity of the soil will be maintained or improved. I don’t accept the idea that the sand ‘tubes’ becoming capped off and become dry areas especially if you continue to maintain the lawn with de-thatching, aeration and top dressing. Even if old tubes did got capped off they would have been replaced by many more in subsequent maintenance. The idea that the tubes persist long enough for this also ignores the existence of the humble earth-worm who will disperse the sand long before this can happen. And if you are arguing that the lawn would become uneven if you stopped maintaining it, well, what in gardening doesn’t deteriorate if you neglect it? Do you think I should add some strenghtening agent such as sharp sand to the soil to try and solidify it a bit more? No, I don’t think that would help. It would be better to focus on improving the biology of the soil so the microorganisms can work on improving the structure. I would use EM ( https://www.smilinggardener.com/sale/effective-microorganisms-and-scd-probiotics/ ) and mycorrhizal fungi ( https://www.smilinggardener.com/sale/mycorrhizae-for-sale/ ). Hello Phil, I need to level my lawn on area of staying water ( middle of my backyard) or maybe even build a hump to help this water go to drainages which are on both sides of my backyard. Somehow I see more staying water when our Bermuda gets brown for winter, soil is hard and full of dry grass chipping. I was recommended to add mix of good top soil with sand to raise the lower area. I did it over summer few times but probably not enough (was afraid to kill the grass). We are in GA, clay soil, I see you recommend just top soil to level. My question: can I still add top soil in winter time when grass is all brown and how much (high) I can do so I won’t kill the grass. Thank you so much. Yes, you can do it. I do max 1/2 inch each spring and fall each year until I get to the desired level. Personally, I would wait until spring as it’s pretty hard on the grass to do it now. My lawn has some muddy parts to it. I am thinking about aerating and then adding seed (overseeding). Should I see then topdress or topdress then seed? I topdress first, then spread seed, then water in. Hi John, I’m not seeing where I or anyone else recommended compost to level a lawn. Am I missing it? The article itself is about using compost to top dress. Top dressing here is also referred to as “leveling” and used interchangeably. Sorry John, I’m not seeing that anywhere here. I do see several places in the comment area where I suggested people use soil if they need to level, but the article is proposing compost for a different purpose. I live in South Texas San Antonio area. My house was put in on farm land. The top soil consisted of sand and then the dirt that was in the grass that was laid. I have put topsoil on twice once 1 inch thick without aeration. Then this year 1/2 inch thick. Aerating before it was laid this year. But then it rains and washes the topsoil away because the grass doesn’t have time to take hold. The grass has trouble growing or spreading because hard dense clay. When I aerate by hand it won’t even pull spikes just makes a hole when I aerate with a machine it will pull out plugs but the first time I tried with a machine it was so hard the machine just skipped across the ground in parts and I had to water multiple times to get the machine to pull out anytype of plug. I aerated this year put down topsoil compost mix and overseeded and not seeing results or grass spread real good. I am considering manual aerating then filling each hole with compost. Do you have any suggestions on how to to get this clay to break up and get grass to spread? 1. Yes, aeration followed by compost is a good idea. 2. Improving soil biology is also important, which could include backfilling those holes with mycorrhizal fungi and also spraying monthly with Effective Microorganisms. I sell both of these things on this site or you can find them elsewhere online as well. 3. Improving soil chemistry is important. Compacted clay is partially a fertility imbalance. Often sulfur is helpful, but the form of sulfur depends on your soil. This is where sending a soil sample to a good lab and working with them becomes important. I discuss this elsewhere on the site, too.